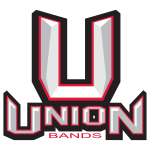 About Union Bands – Excellence on and off the stage! The Union High School Band Program is one of the finest in the Pacific Northwest, having garnered awards and honors with each of its instrumental ensembles over the short 10 year history of the school. The program serves around 200 students and performs throughout the year, hosting multiple concerts, performing at school and community events, and performing at local, regional, state and national band festivals and competitions! The athletic bands – performing at football games in the fall and both boys and girls basketball games in the winter – are known for their large numbers and enormous sound throughout the state. The Parade Band in May, performing at the Starlight Parade every year, has won the Sweepstakes two years in a row, surmounting over 100 other competing groups. The Wind Ensemble has performed as a featured band at the Music for All National Concert Band Festival (nationals for concert bands) twice in its 10 year history – and you can only apply once every 4 years. Student-ran competitive ensembles regularly place at and win state championships every year, while Jazz Ensemble 1 (sweepstakes) and Jazz Ensemble 2 (3rd place) recently placed at the Music at the Parks festival competition at Coeur d’Alene. There is something for everyone in Union Band, and regardless of skill level or time commitment, all are sure to be pushed towards excellence and have a family of musicians waiting for them! About Union High School Union High School (Camas, WA) is the second newest high school in the Evergreen Public School District (Vancouver, WA) having opened in the fall of 2007. Union has an enrollment of 2500 students, grades 9-12. Union is known throughout the Pacific Northwest for the excellence of its academic, athletic, and music programs, all of which rank near the top of the state of Washington. Union’s Music Department includes band, percussion, choir, and orchestra programs that involve around 500 UHS students.